A Sensory Testing & Training Company - St. Croix Sensory, Inc.
Art & designLighting, Sound… Now Scent! Action! 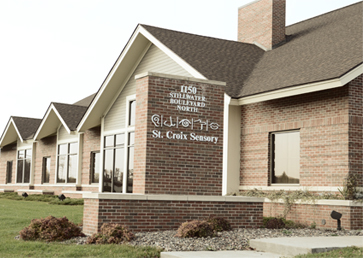 St. Croix Sensory is an industry-leading sensory evaluation laboratory located in the St. Croix River Valley of Minnesota. Since 1980, St. Croix Sensory’s laboratory has specialized in sensory testing of environmental samples, commercial products and materials. St. Croix Sensory manufactures and markets state-of-the-art odor sampling and measurement equipment. The products we represent set the standard in the sensory testing industry. St. Croix Sensory is dedicated to providing and maintaining the highest standard of quality for all laboratory services and manufactured products. St. Croix Sensory maintains a professional practice that continually reviews ASTM International, CEN (European) and ISO methods. Our quality control practices ensure quality is met from receiving of materials and samples to the finished products and final reports delivered to our customers. Kirsten joined St. Croix Sensory in 2017, upon completion of her Masters degree at the University of Minnesota Department of Food Science & Nutrition. Carrie came to St. Croix Sensory in 2011, joining the accounting and client relations team. Holding a B.A. in Mathematics from St. Olaf College, she enjoys the opportunity to balance both a professional and family life. When not crunching numbers, Carrie takes pleasure in her involvement with her children’s activities. She, along with her husband, remain active musicians performing in a community ensemble. Michelle has been a part of the St. Croix Sensory team since 2007. She joined us as a Test Administrator and now works as our Laboratory Manager. She worked for over 10 years in the dot-com industry as a Project Manager/Producer developing web applications for large clients and then moved on to working with news stations managing advertising campaigns on the web. Now, as an empty-nester, Michelle spends her free time snowmobiling, boating on the St. Croix River and enjoying her new puppy Macy! Marny joined St. Croix Sensory in 2016. She manages company-wide marketing as well as sales of Nasal Rangers and other products and equipment sold and rented to our clients. She is a graduate of the University of St. Thomas and previously worked in digital project management and event planning. As a mother of four, Marny enjoys chasing after her kids and writing about their adventures in her column for the Stillwater Gazette. Ben joined St. Croix Sensory in 2017. He assists in laboratory duties and running sensory test sessions as well as managing Nasal Ranger manufacturing and service. Sally joined St. Croix Sensory in 2018. She assists in laboratory duties and running sensory test sessions as well as managing Nasal Ranger manufacturing and service.